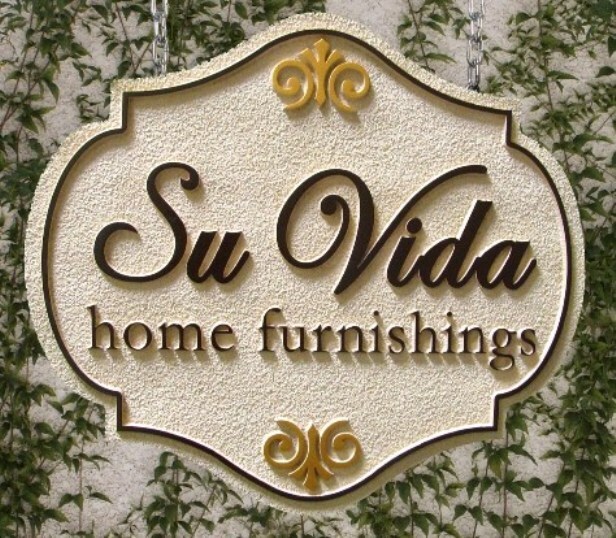 This elegant and decorative carved sign for the "Su Vida" Home Furnishings Store makes good use of muted neutral colors. The sign makes us want to visit the shop to see equally tasteful furniture. It has raised script font lettering, an ornate shape, and two fleur-de-lis as artwork. The interior background of the sign was sandblasted in sandstone texture. The sign has been painted with long-lasting automotive-grade enamels and clear-coated twice, making it suitable for either indoor or outdoor use. It can be mounted on a wall or hung from a wood or iron hanger/scroll bracket projecting out from the wall or a post.